The mission is simple: serve delicious food That has been locally, organically and sustainably sourced. Black Cat Natural Foods has a catering menu for every occasion. from a 15 person dinner party to a 200 person corporate event. Here are a few of our most popular catering menus. We also specialize in custom menus and can accomodate many dietary restrictions. For a complete list of our menus please feel free to contact us. All of our menus start at $25 per person. Baked Salmon with lemon and dill. Saute’d green beans with shallots and white wine. Roasted new potatoes with fresh herbs. Green salad. Organic fruit platter. Homemade cookies. 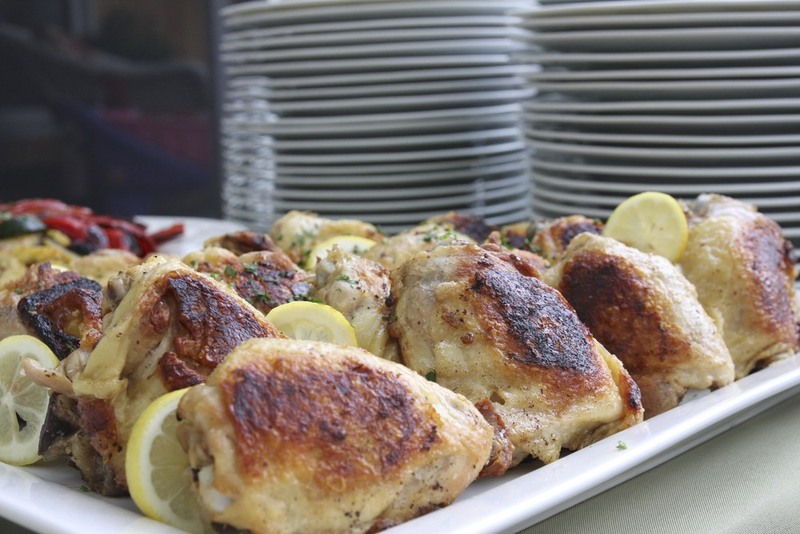 Herb roasted chicken breasts, thighs and legs seasoned with oregano, thyme, basil and sage. Oven roasted potatoes, carrots, celery and whatever other delicious vegetables are in season. Mixed green salad with red peppers, cucumbers, croutons and dressing. Organic fruit platter with grapes, strawberries, pineapple, melons, other berries while in season. Dessert. Usually homemade cookies . Slow braised Heritage Berkshire pulled pork. Corn and flour tortillas. Spanish rice. Black beans. All of the taco fixings. Mixed greens salad. Organic fruit platter. Homemade cookies. Baked chicken breasts with a tarragon cream sauce. Saute’d green beans with shallots and white wine. Roasted beet and chevresaldwith toasted walnuts and a balsamic reduction dressing. Organic fruit platter Homemade cookies.